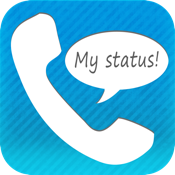 My Status is a new and advanced dialer ! Whether you are available, a sleep or in a meeting. In addition you can set "time to default"
My Status will automatically set back the default status – Available!